What has been happening to polar bears in recent decades? Polar bears have long captured the attention of the general public but probably at no time in the past have they been more in the forefront of the public's imagination than today. Today's heightened interest in polar bears may be due in part to an enhanced understanding of the ecology of polar bears, their environment, and an increased interest in Arctic issues brought on by concerns for climate change. Results of years of research and studies are now available to an interested public, and efforts to communicate this information to the public has been more effective in recent years than in the past. As a result the current public is generally well-informed and educated regarding the ecology of polar bears. This public, unlike previous publics, has a variety of communication tools that enable it to interact and communicate more effectively with researchers and managers. What have we learned? We now know that polar bears are not a single large homogeneous population that roams throughout the Arctic. Instead groups of polar bears referred to as stocks or populations, are distributed throughout the Arctic. 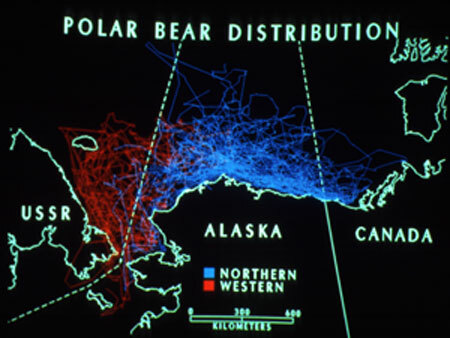 Research begun in the late 1960s and continuing today also provides a thorough backdrop of information on population demographics, systematically analyzed data on population boundaries, population movements, population size, reproductive and survival parameters, and other useful information about biological, physiological, and ecological aspects of polar bears. We also realize that polar bears do not occur in large numbers; their ability to replace individuals in the population is very limited and population growth is extremely slow; they are long-lived creatures, which helps to offset the low reproductive potential; their populations fluctuate in response to natural factors such as climate and prey availability; and, populations can also be impacted by humans through factors such as hunting, oil spills, shipping, and other activities. We also realize that the level of human presence and activity in the Arctic continues to build. As a result the potential for humans to impact polar bears has never been greater than today. Technologically, researchers have been blessed in the last 30 years. Advances in satellite telemetry allowed researchers to follow individual bears over time and greatly enhanced our knowledge of movements and population bounds. Infrared thermal sensory equipment is providing promise in detecting polar bear dens beneath the snow. Extended time-series of data now available for some populations documents trends that were previously not apparent. Improvements in aircraft and vessel transportation have provided access to a larger portion of the range of polar bears than was previously accessible. Finally, technologic advances have allowed for multi-disciplinary Arctic research, which is in many cases supported by polar-class icebreakers. All of these advances plus greater understanding of population dynamics and population modeling now allow for greater precision in making management decisions and a better understanding of risks and consequences of management actions. In the past, one of the greatest saving graces for polar bear populations was the fact that their habitat was relatively pristine and secure from alteration. In fact a very large portion of the high arctic was void of any human presence. Hence at that time the greatest concern for polar bear populations were over harvest and human development that was occurring at the fringes of the range of polar bears. Polar bears and their prey have evolved to living in the extreme conditions of the Arctic. Polar bears and seals are dependent on sea-ice for foraging, resting, and reproduction. The Arctic ecosystem was shaped by climate and continues to be driven today by climate. Polar bears and ice seals, primarily ringed seals, serve as key indicators of the effects of climate change on the Arctic environment. Today, polar bear populations are facing threats previously unprecedented during recorded history in the Arctic. Recent climate change scenarios based upon modeling of climate trend data predict that the Arctic region will experience major changes in the upcoming decades. On the most drastic end of the spectrum one model predicts that the Arctic basin may be void of ice within 50 years. Other models have shown that ice thickness has decreased by 40% during the past 30 years and the average annual extent of ice coverage in the polar region has diminished substantially, with an average annual reduction of over 1 million square kilometers. As a case in point, in Western Hudson Bay researchers have collected demographic information on polar bears since 1981. Over this time frame and location the sea ice breakup has been occurring earlier. The earlier breakup has been related to the poorer condition of polar bears and there is a correlation between the earlier breakup and a decadal scale pattern of warming air temperatures during the spring between 1950 and 1990. 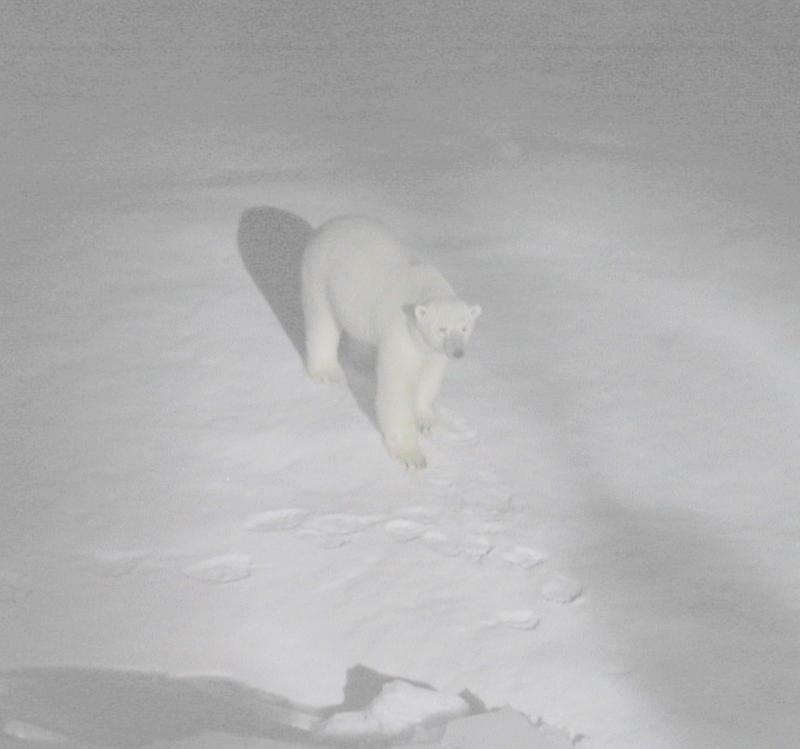 It appears that earlier breakup caused by warmer temperatures has resulted in declines in physical and reproductive parameters of polar bears in this area. This is the only study to date to demonstrate the effects of changed environment resulting from climate changes, and a corresponding effect on polar bears. Climate change is not uniform in all areas of the Arctic, however. Since Hudson Bay is located at the southern most extent of the range of polar bears, findings here may be a forewarning of changes to come in future years for other areas of the Arctic. Clearly, climate change and its effect on sea ice and polar bears should be closely monitored in future years. Environmental contaminants in the form of persistent organic pollutants (POPs) pose an additional area of increased concern for polar bears. Recent documentation of baseline contaminant levels in the circumpolar environment and in key species has dramatically expanded the knowledge of regional presence and levels of these pollutants over the past 10 years. Polar bears, as an apical predator that tends to amplify the accumulation organochlorines compounds, are a perfect candidate for studies in evaluating trends. We now know that polar bears inhabiting certain areas of the Arctic exhibit elevated levels of organochlorines, particularly PCB's (poly chlorinated biphenyls) while populations inhabiting other areas have lower levels. Laboratory experiments involving elevated levels of organochlorines have been associated with a range of effects including neurological, reproductive, and immunological changes. Studies are continuing to evaluate the effect of persistent organic pollutants on essential life functions of polar bears and other marine animals with an emphasis on evaluating immune and hormonal systems. International involvement in polar bear conservation dates back to 1965 when scientists from Canada, Norway, Denmark, USSR, and the United States met in Fairbanks to discuss polar bear conservation due to widespread concern that populations were being over harvested. Until this time there had been very little management of polar bears in the Arctic and no coordinated effort among arctic countries. Harvest rates were rising rapidly in most areas except Russia which had enacted a ban on hunting in 1956. The Fairbanks meeting resulted in the formation of the IUCN/SSC Polar Bear Specialist Group (PBSG) whose mission was to coordinate polar bear research and management programs on an international basis and to exchange information on each country's programs. Members of the PBSG and the countries they represent developed and negotiated the International Agreement on the Conservation of Polar Bears (Agreement), which was signed in Oslo, Norway in May, 1973. Among other conditions the Parties agreed through Article VII to "conduct national research programs on polar bears, particularly research relating to the conservation and management of the species. They shall, as appropriate, coordinate such research with the research carried out by other Parties, consult with other Parties on management of migrating polar bear populations, and exchange information on research and management programs, research results, and data on bears taken." The PBSG meets every three to five years with a goal of advancing the principles of the Agreement. The most recent meeting was held June 2001 in Nuuk, Greenland. The proceedings of the working group meetings are published in the IUCN series. Highlights of recent activities include: conducting ecotoxological studies to evaluate potential effects on polar bear immune and hormone systems in the Svalsbard Island complex; continuing efforts to refine population boundaries and better understand sustainable harvest levels or the effects of harvests on populations; evaluating new techniques to conduct aerial population surveys; evaluating the relationship between bears, seals, and sea ice conditions; population genetics studies; and research to evaluate the effectiveness of thermal sensory technology to detect polar bear dens beneath snow; and. The IUCN PBSG recently developed a web site that can be located at http://pbsg.npolar.no. This site includes a wealth of information including presentations from the last meeting, at Nuuk, Greenland, June 2001, population status and trends, a summary of the main issues facing polar bears (climate change, development, contaminants, and hunting), polar bear life history facts, members list and contacts, and a list of other pertinent links.